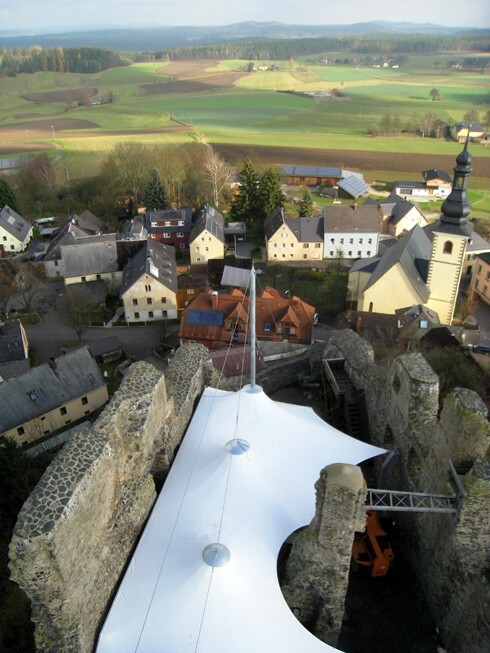 The conspicuous castle ruins of Thierstein are a popular tourist destination amidst the impressive landscape of the “Fichtelgebirge”. 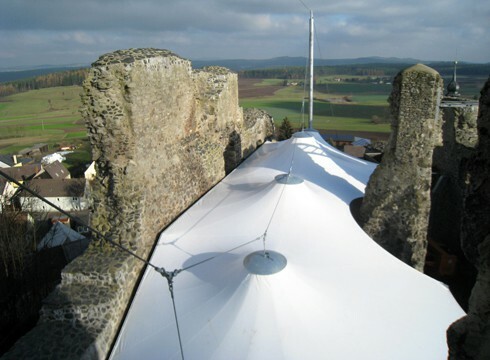 First time mentioned in 1340, the castle was built on a basalt spur and overlooks the entire scenery of the “Fichtelgebirge” with a magnificent panoramic view. The different dilapidated exterior walls form a large courtyard. 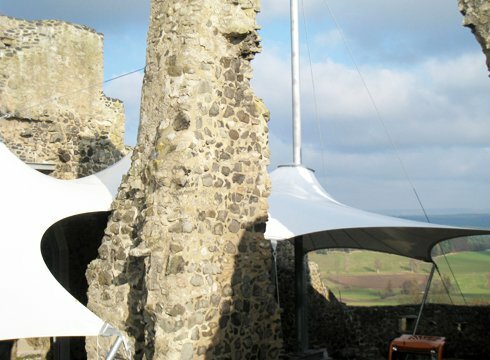 The whole plant is highly dominated by the well-preserved, massive castle keep, which includes a small museum showing farming equipment and exhibits on the history of the castle. In summertime the courtyard of the castle is used for various festivals, theatre and concerts. 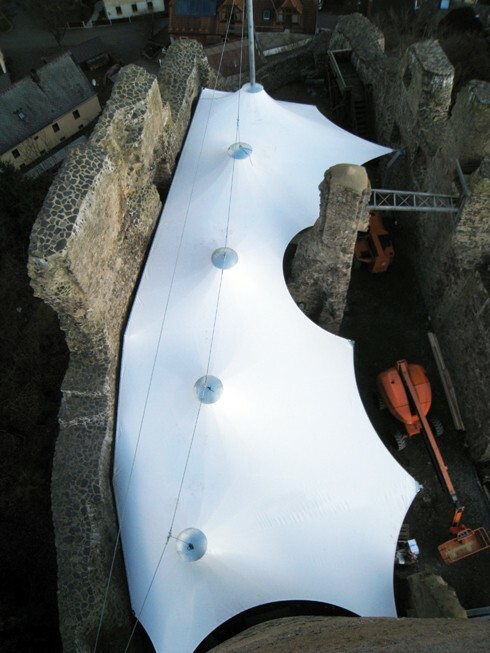 In order to carry out the events independently of the weather, a seasonal demountable, lightweight roofing was sought, protecting a smaller audience up to 200 people and a stage area. 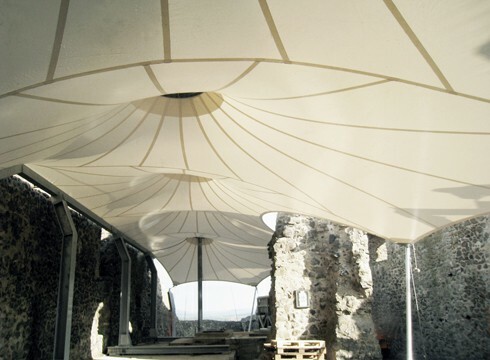 Based on a technically simple assembly concept, the rigging of the membrane roofing should be possible by employees of the communal building yard. 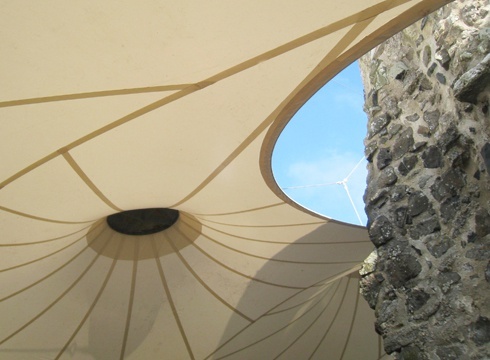 The design takes into account these requirements as well as the desire of the monument protection authority, to keep the roofing invisible from afar. 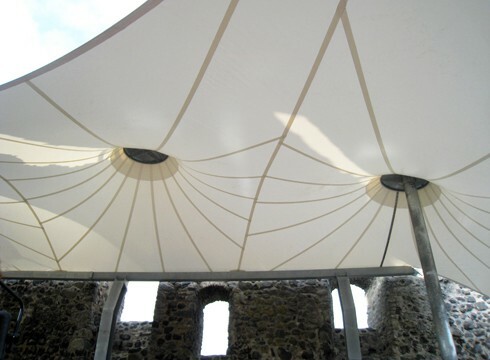 The membrane exactly fits into the ruins in a very individual geometry, attached linearly along the northern wall, otherwise shaping free edges and individual anchor points. 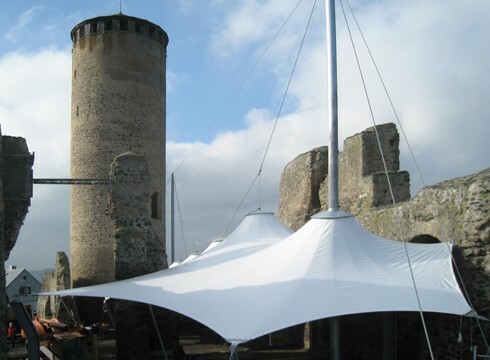 The textile fabric is suspended with 5 high points from a central support rope and biased against wind loads. 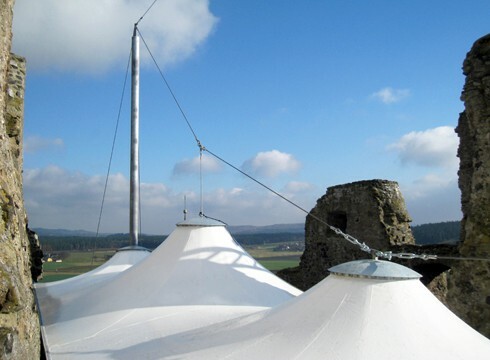 The two main masts and the supporting cable must not be removed, most components of the steel structure remain yearlong. All steel elements are hot-dip galvanised. 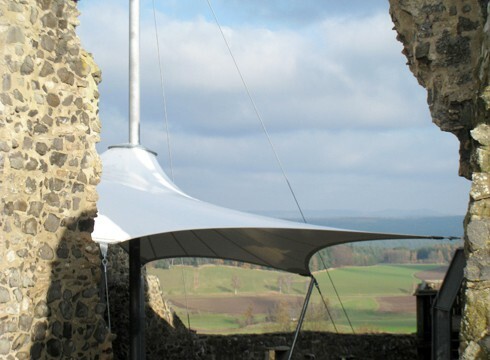 The entire roof structure remains statically independent from the old parts of the ruin. 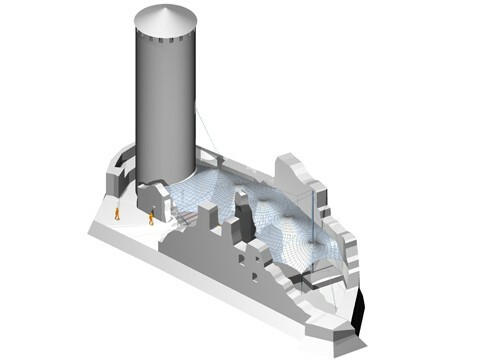 To this end, individual foundations were produced, anchored in the rock by micropiles (system Ischebeck). 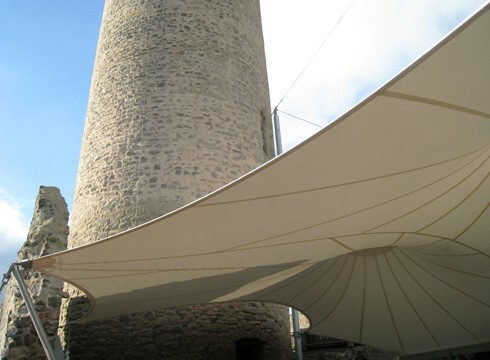 The textile membrane covers an area of 350 square meters and consists of a translucent PVC coated polyester fabric (PVC -PES). With the 2014 season, the membrane roof is first put into operation.